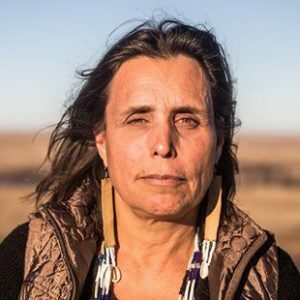 Winona LaDuke—an Anishinaabekwe (Ojibwe) member of the White Earth Nation—is an environmentalist, economist, author, and prominent Native American activist working to restore and preserve indigenous cultures and lands. She graduated from Harvard University in 1982 with a B.A. in economics (rural economic development) and from Antioch University with an M.A. in community economic development. While at Harvard, she came to understand that the problems besetting native nations were the result of centuries of governmental exploitation. At age 18 she became the youngest person to speak to the United Nations about Native American issues. In 1989 LaDuke founded the White Earth Land Recovery Project in Minnesota, focusing on the recovery, preservation, and restoration of land on the White Earth Reservation. This includes branding traditional foods through the Native Harvest label. In 1993 LaDuke gave the Annual E. F. Schumacher Lecture entitled “Voices from White Earth.” That same year she co-founded and is executive director of Honor the Earth, whose goal is to support Native environmental issues and to ensure the survival of sustainable Native communities. As executive director she travels nationally and internationally to work with Indigenous communities on climate justice, renewable energy, sustainable development, food sovereignty, environmental justice, and human rights. Among the books she has authored are All Our Relations: Native Struggles for Land and Life (1999, 2016); The Winona LaDuke Reader: A Collection of Essential Writings (2002); Recovering the Sacred: The Power of Naming and Claiming (2005); The Militarization of Indian Country (2013). LaDuke’s many honors include nomination in 1994 by Time magazine as one of America’s 50 most promising leaders under 40; the Thomas Merton Award in 1996, the Ann Bancroft Award for Women’s Leadership in 1997, and the Reebok Human Rights Award in 1998. In 1998 Ms. Magazine named her Woman of the Year for her work with Honor the Earth. She was inducted into the National Women’s Hall of Fame in 2007, and in 2017 she received the Alice and Clifford Spendlove Prize in Social Justice, Diplomacy, and Tolerance. Winona LaDuke was an active leader as a Water Protector with the Dakota Access Pipeline protests in 2017 at Standing Rock, where the Sioux Nation and hundreds of their supporters fought to preserve the Nation’s drinking water and sacred lands from the damage the pipeline would cause. Over the years her activism has not deviated from seeking justice and restoration for Indigenous peoples.